Gang, All hands on Deck! I am not as pessimistic as others. Do not lose heart. This Summit will not fail. No matter what, we are part of an irreversible shift in consciousness about our responsibility to Mother Earth. Let's keep the sign-ups happening. Send this out to everyone you know. Sign the giant petition - it may be the largest in history. 11/23/09 -- You have got to check out the video above of Lucy singing in the shower to promote the Sign On concert! 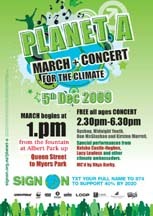 11/21/09 -- Poster now reflects new starting point for Sign On march on December 5. 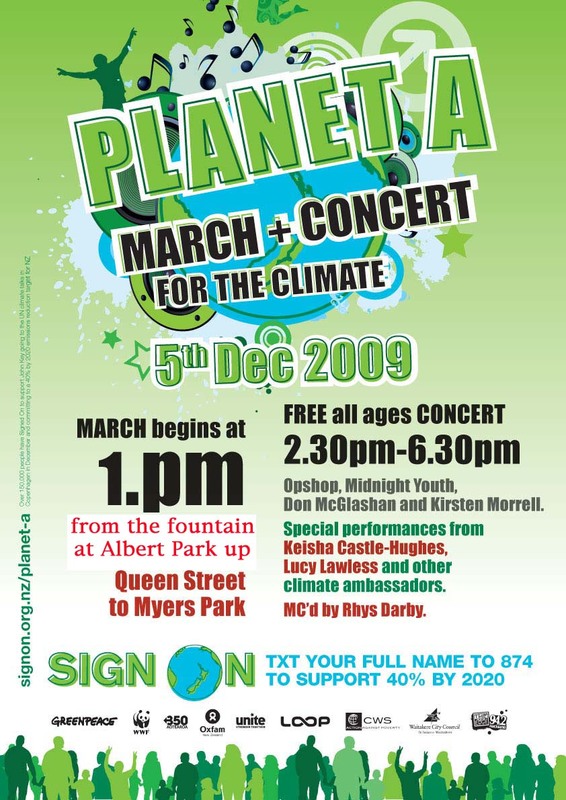 11/18/09 -- New blog from Lucy about her adventures with the Sign On Greenpeace campaign to get the NZ Prime Minister, John Key, to go to the world climate change summit in Copenhagen. Also, the December 5 NZ Sign On concert Lucy is performing in will be available for viewing, worldwide, on the web. Thanks for speaking up and Signing On. We have to tell our governments the financial recession is not an excuse to do nothing. The catastrophe of Global Warming will make the recession look like a sour little joke. Clearly, something has to change. Nobody ever went out of business by adapting to the times. John Key, carry our message to Copenhagen this December. We care desperately about the health of this planet. There are brilliant minds in science, engineering and agriculture who know how to reduce our contribution to Climate Change. Let's Not waste time and knowledge. The Earth has been so good to us. What have we done for Her lately? 6/27/09 -- Lucy's back with a new message about the "Sign-On" campaign. And a missed opportunity to go to the Peterman Glacier to see the effects of global warming firsthand.